Home / Dogs / What Do You Know About Leishmaniasis? It has taken many lives, but it doesn’t win all the time! Small, discrete and with a light yellow colour, the Phlebotomus mosquito (sandfly) is the main cause of Leishmaniasis in our pets, especially in dogs throughout the world. Contamination starts when an infected animal is bitten by a female sandfly. 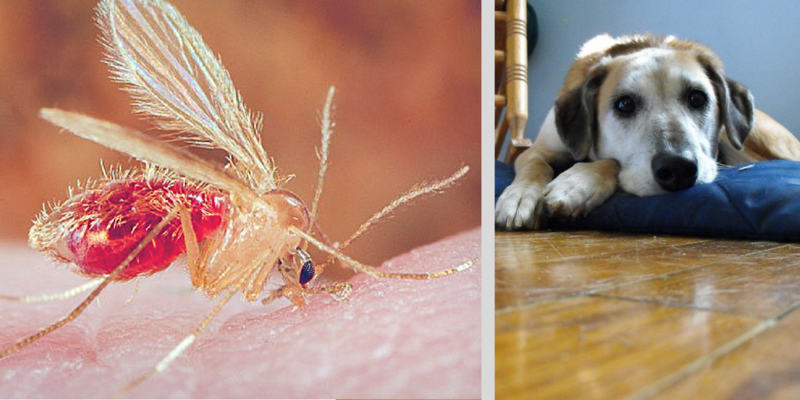 Only the female sandfly feeds on blood, so when she snacks on a healthy dog after having become infected from feeding on a sick dog, she transmits the parasite and infects our pet. Sometimes an immediate diagnosis is hard when it comes to Leishmaniasis as there might be no symptoms right after the bite. The symptoms might take months or in some cases even years to appear. With favorable conditions within their definitive host, the dog (usually), the Leishmania parasite thrives and spreads to other body parts such as skin or internal organs. fur loss, mainly around the eyes, ears, neck, joints or tail. Along with these, there might be internal organs commitment that lead to arthritis, renal failure or hemorrhagic gastroenteritis. It also leads to an immunosuppressive state, meaning that the pet becomes prone to other infections due lack of a healthy defense system. The evolution of disease varies and there is no known correlation between severity of infection (in terms of parasite number) and the intensity of clinical signs. However, it is important to know that if these symptoms are not treated, they can lead to your pet’s death. Leishmaniasis is also a very serious public health concern in countries like Brazil where both human and canine cases of visceral leishmaniasis are a real concern. This mosquito lives mainly in the Mediterranean regions and in South America due to the mild climates and higher temperatures. Specific vaccination that reinforces the immune system can be taken after your dog is 6 months old, but only if they are not carrying any infectious disease including Leishmaniasis. Pay attention to the summer months, especially the ones with higher temperatures to reinforce the preventive care, mainly in large animals, with short fur or the ones living outside or close to these specific climate areas. Assure you pets are healthy and well nourished, vaccinated and regularly dewormed, so that their immune system can react quickly and efficiently to the parasite. What if my dog become infected? Calm down, it’s definitely not the end! With frequent medication, it is possible to keep the disease under control, although it’s never cured. The diagnosis of Leishmaniasis on it’s own is not a reason for euthanasia, unless the severity of the disease is beyond treatment and you find your pet at the last stage of life with quality. It is extremely important to keep the prevention and protection methods in place even if your pet is infected, so that you may prevent others from becoming infected too. Besides, Leishmaniasis is not a direct zoonosis, so it is not transmitted to humans and other animals by direct contact or proximity with the infected one. This parasite is only transmitted by the bite of the phlebotomus insect. It is possible for infected dogs to live for many years with good quality of life and close to their family and other animals, as long as they are protected and undergoing treatment. Having the infection only brings about some changes in routine and, more than ever, the certainty that your best friend needs you!